On 17 May, what has sadly become the annual Protest Vigil at the Eritrean Embassy in Islington, London , appropriately took as its motto, “Ten Years is too long.” As on previous occasions the protesters took up their position on the pavement opposite the embassy. They represented a wide rank of Christian denominations as well as of several human rights groups (Christian Solidarity Worldwide, Release International, Release Eritrea, Church on Chains, Human Rights Concern Eritrea) who came together to pray for the persecuted Christians of Eritrea and their government. A large number of the banners portrayed His Holiness Abune Antonios, the imprisoned Patriarch of Eritrea. 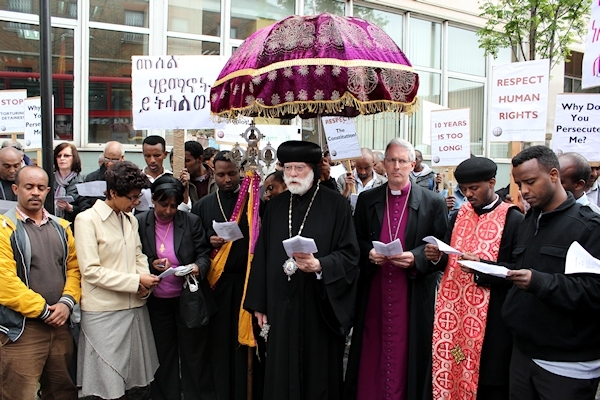 Abba Seraphim was joined by the Bishop of Southwark (The Right Rev’d Christopher Chessum), Father Yonas Tesheme (Sheffield) and Deacon Joannes Gebrehiwet (Manchester) with a number of other deacons representing the Eritrean Orthodox Diocese of Europe. Speakers and Prayers were led by Abba Seraphim, Andy Dipper (Release International), Dr. Berhane Ashmelesh (Release Eritrea), David Turner (Church in Chains), Elsa Chyrum (Human Rights Concern Eritrea), Selam Kidane (Release Eritrea), Dr. Khataza Gondwe (CSW). At the end of the vigil a letter, signed on behalf of the whole group by Abba Seraphim and Bishop Christopher, was delivered to the Ambassador. 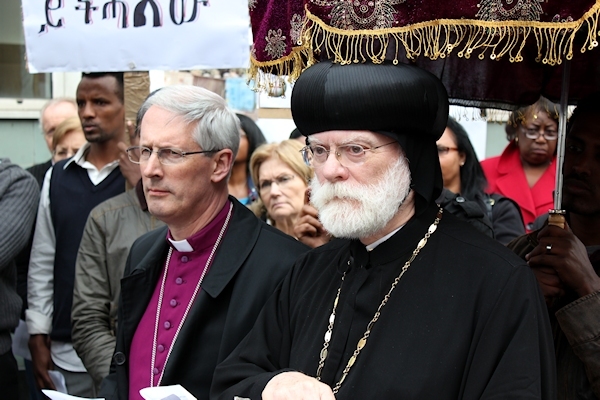 The two bishops and Dr. Berhane were kept waiting at the door and when the Metropolitan Police tried to find an Embassy official to whom they could deliver it, they were at first ignored and then rudely shouted at and told to go away. Eventually the police delivered the letter on their behalf.